82.74 sq m plus excellent basement storage. The flat has a Kitchen, 2 bedrooms and a bathroom on the first floor with very large open plan living space on the second floor. 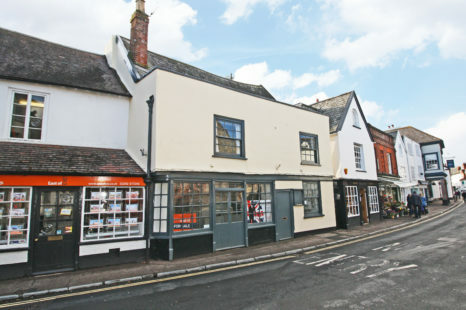 Large Double fronted shop in the heart of Topsham retail area. Good ancillary space to the rear and large dry cellar. There is rear access and parking space. Over the shop is large charming flat on two levels with private rear access and courtyard garden with many period features including fireplaces.